Special message: I learned via Twitter from Paul Thompson, a local photographer and blogger here in Dallas, that Boeing will be at the American Airlines C.R. Smith Museum through October 5 with the 787 DreamLiner Flight Deck Demonstrator. If you live in the DFW area (or plan to be visiting) you might want to head over to Ft. Worth and see it (they’re closed Sunday). The link on the C.R. Smith website to the 787 DreamLiner Demonstrator exhibit doesn’t work, go here for more info. A big thank you to AAflyer for alerting me via a comment that the second video in the American Airlines Commercial Scavenger Hunt contest has been posted to their Facebook page. The winner receives 200,000 AAdvantage Miles and a 1 year pass from Gogo Inflight Internet, and everyone will get 100 AAdvantage Miles just for entering. To enter, just go to Facebook.com/aa, watch the videos, then answer three questions about each commercial. I assume that if you’ve already submitted three answers with the first video, that you only need supply answers to the second video. You won’t be asked to submit your AAdvantage number. 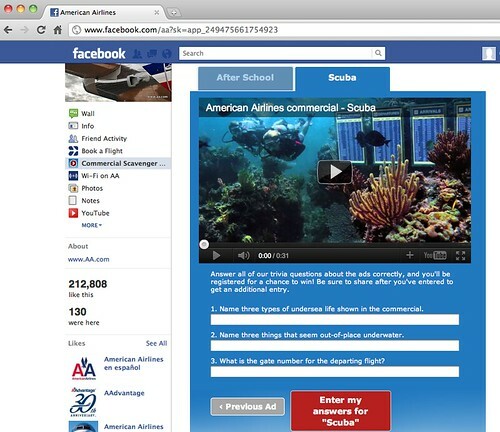 American will contact you via your Facebook email address to supply you with a code for your 100 AAdvantage Miles. If you win, they’ll probably contact you the same way. There will be 3 commercials total (the third video will be posted October 5), and each video will have 3 questions. To get earn an entry you will have to correctly answer 6 of the 9 total questions. You can gain a second entry by sharing the promotion with your Facebook friends. Go here to get started. 1. Name three types of undersea life shown in the commercial. 2. Name three things that seem out-of-place underwater. 3. What is the gate number for the departing flight? I’m almost positive it’s a Manta Ray, not a Stingray. I answered the questions on the first video a week or two ago but haven’t received an email from AA with my 100 miles … have you? Coral would also be another answer to #1. It is a manta ray not a sting ray. @ Shannon – I think they’ll probably post the miles after the promotion ends on October 21. @ Joel and brian – Ah, yes, I see that it is a manta ray. I had to look up the difference manta ray and a stingray, but now I know that if I see a creature with cephalic lobes, I’m looking at a manta ray. Thanks for the correction! Have any of you been able to view the 3rd video? I answered the questions for the first 2 correctly, but I have not been able to find the 3rd. Thanks!! @ Nick – Not yet. Just checked the American Airlines Youtube channel and it’s not their either. Maybe Thursday….stay tuned. Thanks for reading!